It’s no Willy Wonka, but it’s good enough. The new Toothsome Chocolate Emporium and Savory Feast Kitchen opened for previews this morning. 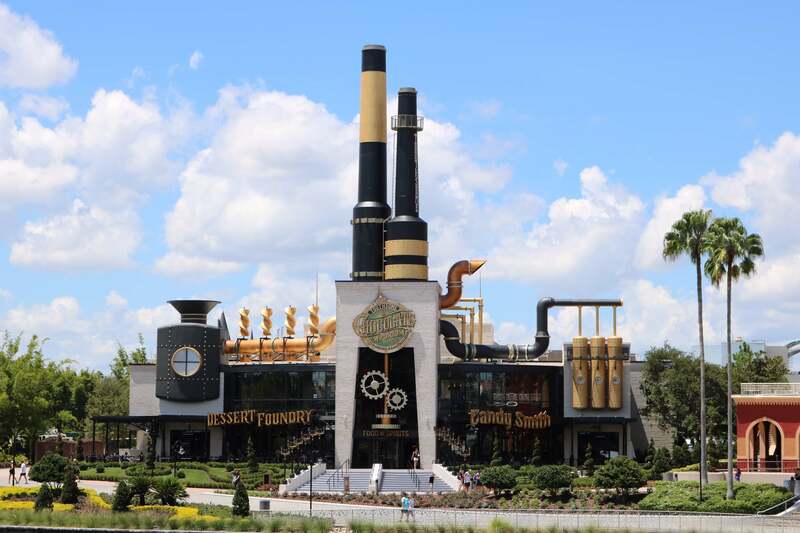 The restaurant is located at Universal Orlando’s CityWalk and is hard to miss. The smokestacks tower over nearly everything else in view. With an exterior like this, let’s see what’s inside. Once you enter the front of the building you are greeted with the host stand. To your right is the Emporium (gift shop) and to the left is the Confectionery. In the lobby are some themed elements. Gears and bags of cocoa are featured in a few of the displays. The gears tie into the moving gears on the exterior of the building. To the right is the gift shop; also this cool looking chocolate apparatus. It’s funny that they put the secret ingredient on display. What could it be? Enough of the lobby, let’s get into the gift shop. Along the wall towards the front of the shop is a collection of steampunk inspired figurines. Some are for sale, others are for decoration, all of them fit the restaurant well. Prices vary depending on the size, but most of these pieces are around $60. Inside the gift shop you can find a boatload of sweets and apparel. Most of which features Toothsome Chocolate Emporium. Most of the apparel features Toothsome’s logo front and center. Luckily most of the apparel goes beyond just the logo. The all-over screen printing makes for some cool designs that match the costumes worn by the Team Members. Of course the sweets are aplenty. There’s a case full of fresh chocolate truffles as well as some pre-packaged candy. There’s also a wall of bulk candies and apothecary jars. You can also use a plastic bag if you just want some candy. Treats, Jars, and Bags are all available here. Speaking of Truffles, there’s a kitchen on display as well. In which they make truffles of course. This is to the right when walking in to the dining area. Of course there’s the dining area itself. Here it’s empty. Something you’re not likely to see most of the times you visit. There’s also upstairs seating just like the former NBA City that once stood here. Back and to the left when you walk into the lobby is the Confectionery. Here’s where you can grab your milkshakes, desserts, and ice cream to go. There’s also a dining area outside in on the patio in front of the restaurant. That’s our quick tour of Toothsome Chocolate Emporium. We’ll have more photos later as we sip, slup, and dine our way though the menu. Be sure to follow us on Instagram, Facebook, and Twitter for the latest from Toothsome and the rest of Universal Orlando Resort.